When we left the meeting he told me, "You are a good sport.” I knew I needed to start planning my exit strategy. I loved my job but I couldn’t trust my boss. He would throw you under the bus in a heartbeat to make himself look good. In spite of how good a job is, once you don’t have a manager that has your back, you will be miserable in that job.
" A bad manager can take a good staff and destroy it, causing the best employees to flee and the remainder to lose all motivation." People don't leave bad jobs, They leave bad bosses. A boss creates fear and makes work drudgery. 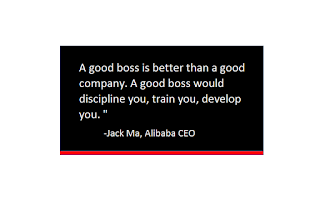 Most of the time an employee has an issue with a company, it is something relating to their boss.You spend half of your life at work, and your immediate supervisor determines the atmosphere. Life is too short to spend 40+ hours a week in constant stress and misery. A recent study says that 56% of employees would turn down a 10% raise to stay with a great boss. The corporate world is full of managers and lacks leaders. Leaders build people up. Managers pull people down. Leaders are those comfortable and secure in who they are whilst managers are competing with their subordinates. Studies show having a bad boss raises a worker's chance of having a heart attack by as much as 60 per cent. Working for a bad boss was actually more of a risk factor for heart disease than smoking, lack of exercise, or being overweight, the researchers calculated. What was it about a bad manager that increased the risk of heart disease? The stress and anxiety caused by unfeasible targets, lack of support, unfair practices and threats of punishment. If your manager doesn't like you, you are on shaky ground. You will always have to keep making sure you dot your i's and cross your t's because they can easily set you up to fail or succeed. High levels of stress is directly linked stress with atherosclerosis, the disease of the arteries that in turn causes heart disease. Never underestimate the impact of working in a toxic environment. It will permeate into every area of your life. Try to move to a different job in the same company, or another company with more competent management. On the other hand, if you do have a good boss, really appreciate them. Good bosses are capable of taking an organization and people to new heights.